The Windsor Chair takes its name from the English town of Windsor, where it originated around 1710. This type chair is a form of wooden seating in which the back and sides consist of multiple thin, turned spindles that are attached to a solid, sculpted seat. It has straight legs that splay outward, and its back reclines slightly. Legend has it that King George II, seeking shelter from a storm, arrived at a peasant cottage and was given a multi-spindled chair to sit on. Its comfort and simplicity impressed him so much he had his own furniture-maker copy it. From this simple encounter, the Windsor vogue was born, according to the Treasury of American Design and Antiques by Clarence P. Hornung. By the 1730s, the chair had crossed the ocean and began appearing in Britain's American colonies. It was first crafted, more than likely, in Philadelphia, before its popularity spread throughout New England and to other regions. 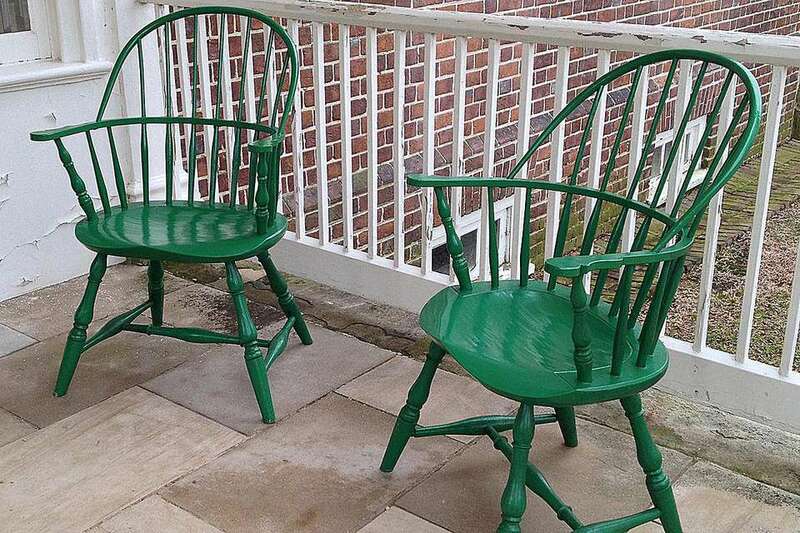 If the Windsor chair developed in England, its form was certainly perfected in America. Colonial craftsmen eliminated the central splat featured in the original chair's back. They also slenderized the splats and legs, and developed, for some models, the "continuous arm" - that is, the chair arms and back rim are made of a single, bent piece of wood. These alterations simultaneously strengthened the chair while giving it a light, airy appearance - "a delicate balance and harmony," as Hornung puts it in his text. Windsors come in a variety of styles, including armchairs, side chairs, rockers, and - as many students of a certain age remember - writing chairs. There are even Windsor settees. The spindled backs come in several heights and shapes too, and Windsor chairs are usually identified by that feature: "low back," "comb back," "bow back," for example. But the best-known, the version that seems to be the quintessential Windsor, is the sack-back or hoop-back. This is usually an armchair with a semi-circular back. These are the ones that often appear in portraits of prominent colonial figures and, as the American Revolution approached, members of the Second Continental Congress. In fact, cabinetmaker Francis Trumble made more than a hundred of them for the Philadelphia State House in the 1770s where the Declaration of Independence was drafted. Windsor chairs were made of a combination of cheaper woods: hickory - an especially pliable wood - for the spindles; pine for the seat; maple, ash, or oak for other components. To disguise the mixture of timber, they were painted: dark green, brown, or black were colors of choice, but lighter hues - reds, yellow, and even white - were used, too. The slightly sunken saddle seats are typically shield- or oval-shaped. Legs on these chairs are often connected with an H-stretcher. They can be simple or elaborately turned; some from the late 1700s to early 1800s are scored to resemble bamboo stalks (with correspondingly scored spindles). Feet take the shape of a simple taper or an arrow foot. Arms typically terminate in paddle or knuckle shapes. The Windsor chair's popularity was derived partly out of its association with the Founding Fathers - Thomas Jefferson, George Washington, John Adams, and Benjamin Franklin all owned them - and partly because the chairs were easy to manufacture. The Windsor chair may have been the first mass-produced style in the United States. Beginning around the turn of the 19th century, furniture-makers began turning out separate components - spindles, legs, etc. Because the parts were interchangeable, they could easily be sold and shipped for assembly by local craftsmen around the country. Furniture historians cite 1725 to 1860 as the golden age of the Windsor chair; after that, it began to seem old-fashioned, and its dominance began to dwindle along with its quality as mass-manufactured models replaced handcrafted or hand-assembled examples. Nevertheless, it has remained a staple in country furniture and enjoyed regular bouts of renewed interest, especially during the 1910s, as part of the Colonial Revival movement in furniture, and the 1980s, with the increased prestige of indigenous American arts and crafts. Today, authenticated 18th- and early 19th-century Windsor chairs can fetch prices in the four figures; those in mint condition, with their original paint, can easily bring five figures. "In a good Windsor, lightness, strength, grace, durability, and quaintness are all found in an irresistible blend," American furniture historian Wallace Nutting noted in A Windsor Handbook. The Windsor was, in a sense, the country's first chair. Like the United States itself, it was an English prototype that developed in its own unique direction.